The road from Irkeshtam Pass to Sary Tash, the first Kyrgyz town of any size, twists and groans up the Pamir Alay. The Pamirs in Tajikistan are visible on your left, the Tian Shan on your right. On the day we passed there was no line between earth and sky, the clouds and the snow just shifting shades of white and grey. 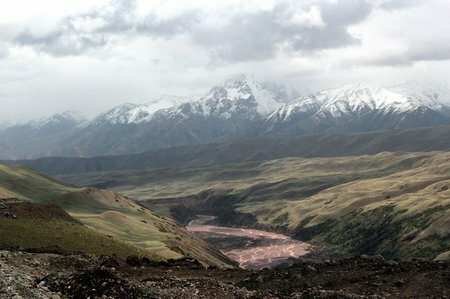 We climbed into the clouds and back down into a world of color, the Alay Valley a flat, worn carpet of greens and browns. On a clear day you can see Pik Lenin standing tall over the valley, but not today. This entry was posted in International Escapades, Kyrgyzstan and tagged Kyrgyzstan, Pamir Alay, Sary Tash, Silk Road on June 25, 2011 by wandermom.